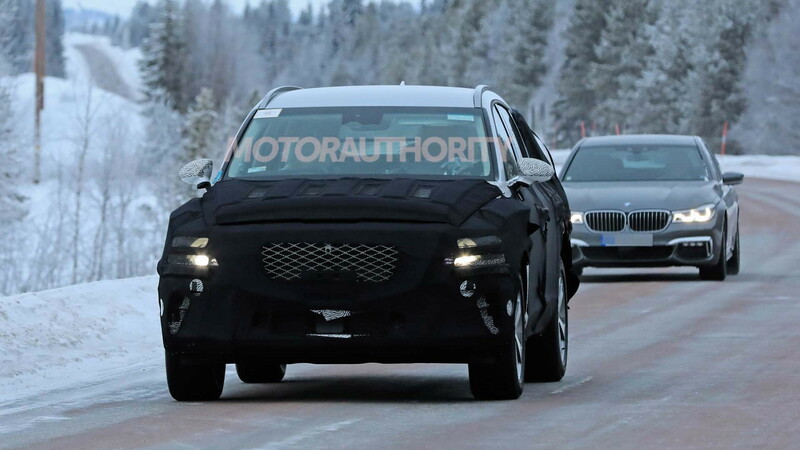 The Genesis GV80 luxury crossover SUV has been spotted testing on public roads in prototype form. The first of two new SUVs due from Hyundai's upmarket Genesis brand in the next couple years, the GV80 will be a mid-size vehicle targeting the BMW X5. It is expected to reach showrooms in late 2019, likely as a 2020 model, and a smaller GV70 SUV aimed at the BMW X3 will trail it by about a year. Previously, we spotted engineers in test mules that featured the new mechanicals hidden beneath the makeshift bodies of cobbled-together Hyundai Santa Fes. 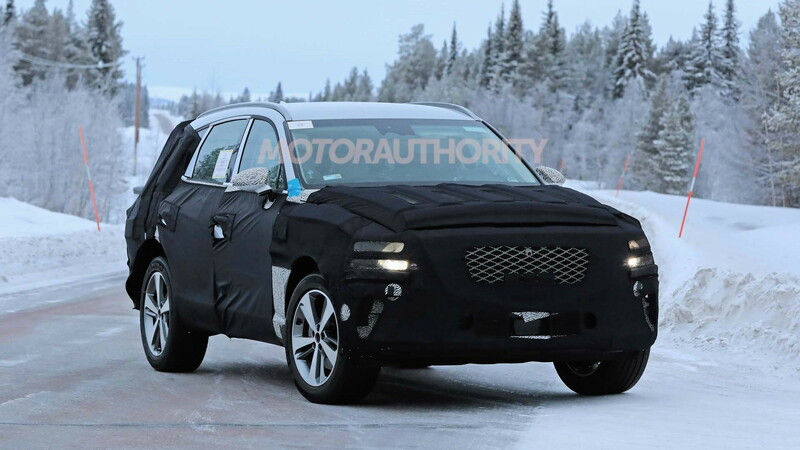 Modifications made to the Santa Fe body indicated the Genesis GV80 would be a longer and wider vehicle, and it turned out to be just that in prototype form. 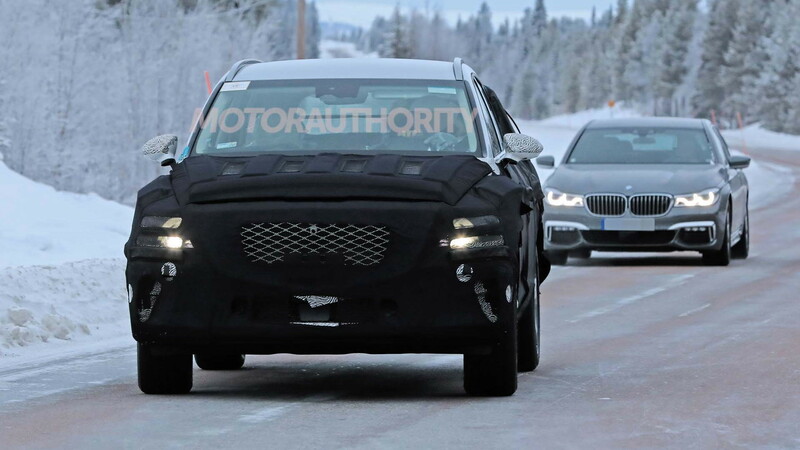 2020 Genesis GV80 spy video from Motor Authority on Vimeo. As the most recent spy shots and video show, it's clear the GV80 will look very similar to the Genesis GV80 concept revealed at the 2017 New York International Auto Show. It's expected to carry the concept's name into production, as well as the sharp design. The G represents the Genesis brand while the V is for the versatility of an SUV. The 80 positions the SUV alongside the mid-size G80 sedan near the top of Genesis' lineup. Expect the GV80's final design to be muscular and imposing, at least if the lines of the GV80 concept and prototype are anything to go by. The hints of Bentley shouldn't come as a surprise as Genesis' design chief Luc Donckerwolke previously had the same role at Bentley. The latest photos show the interior, well, some of it. Draped with tarps to disguise the design and technology, little can be seen. However, we can make out a pair of round dials on the center console that at first look like BMW iDrive-style controllers, but then appear to recess and may have a display on their faces. We've seen the luxurious interior of the 2020 G90, and the GV80 should take cues from that cabin. However, those controllers appear to have a different design and so does the steering wheel. Still, we can expect lots of leather, a large infotainment screen, and open-pore wood. 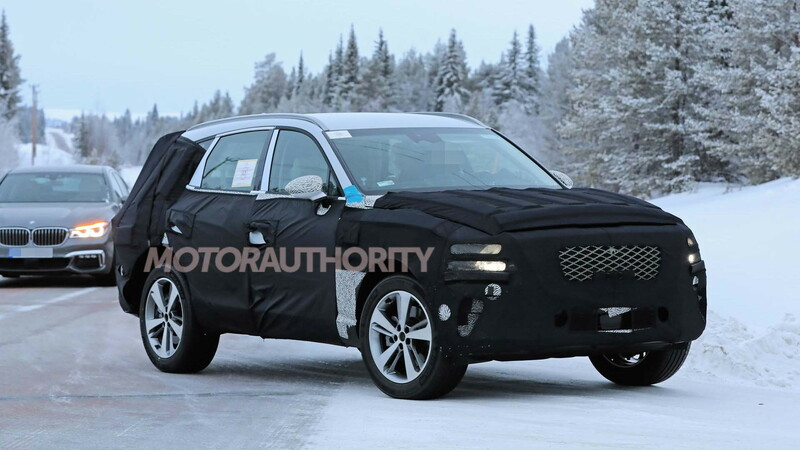 It's not clear what platform Genesis plans for its SUV. One possibility is a stretched version of the Santa Fe's platform or that of the new three-row Palisade, but the short front overhang and long dash-to-axle ratio lead us to believe it's a rear-wheel-drive architecture, perhaps the G80 sedan's platform. All-wheel drive would definitely be an option as it is on the G80 sedan. The rear-drive underpinnings would help to further differentiate Genesis' lineup from Hyundai's. Genesis is already going to the trouble of launching a dedicated dealer network to separate itself from its parent, so unique platforms would also make sense. 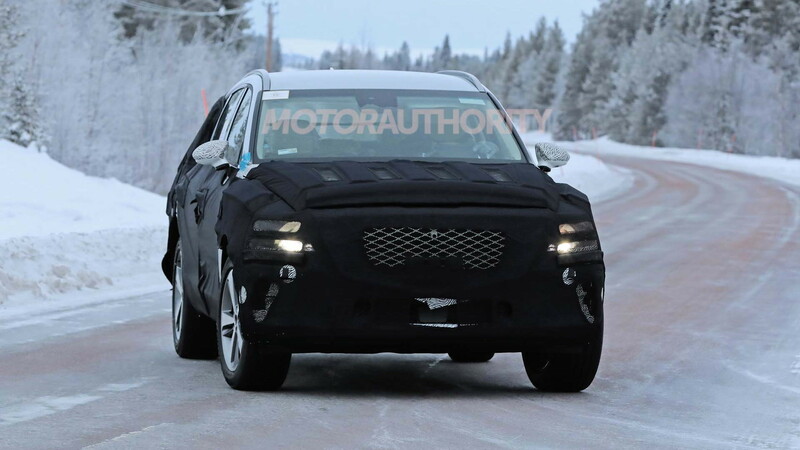 A document attached to a window of one of the early, cobbled-together test mules hinted that a new 3.5-liter V-6 could be in development. The document also indicated that the test mule was fitted with an automatic transmission and all-wheel drive. The 365-horsepower turbocharged 3.3-liter V-6 in the G70 and G80 could also be in the cards. We also expect a plug-in hybrid option to form part of the powertrain equation at Genesis at some point. Having chosen to focus on sedans so far, Genesis has been caught out by the consumer shift to SUVs in the U.S. With SUVs currently outselling sedans, the GV80 can't come soon enough. Nevertheless, it won't have an easy time on the market as BMW and Mercedes-Benz introduced redesigns of their rival X5 and GLE SUVs in 2018.